A simple yet attractive garden arch ideal for enhancing entrances and pathways or as a standalone feature. It has a traditional straight roof and diamond-design trellis side panels that are ideal for climbing plants. Thie simple yet attractive Sunset garden arch is a versatile piece that will suit any garden, patio or terrace of any size. It has an adjustable width of up to 1.8m which allows you to fit into a space to suit your garden and needs. Place at the entrance of your garden, use on a garden walkway with planters, or simply position on its own and delight in its natural features. 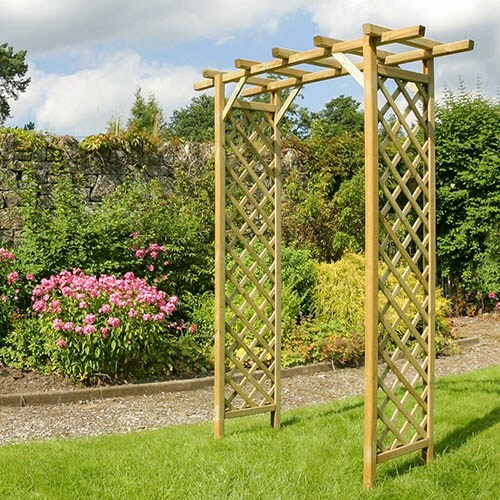 The diamond-design trellis side panels are perfect for supporting climbing plants, transforming the arch into a charming feature. Made from FSC Certified pressure treated timber, not only soes the Sunset Arch add a natural, rustic effect to garden displays, but its strong, durable and comes with a 10 year guarantee against rot. Includes a straight roof and 2 side trellis panels.